EDITOR’S NOTE: Updated Dec. 2 with further confirmation, and details about the Roadster’s target orbit. 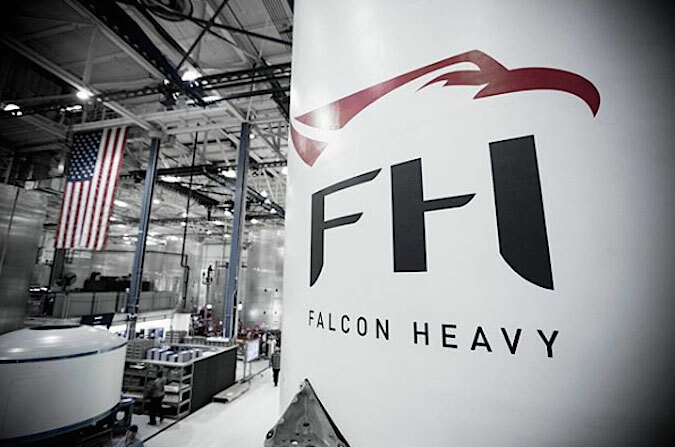 The interstage of SpaceX’s first Falcon Heavy rocket pictured inside the company’s factory last year in Hawthorne, California. Credit: SpaceX. Musk’s Twitter followers weren’t sure whether to take him seriously. “The great part about @elonmusk is that I’m not sure if this is a joke or for real,” tweeted @MikeCharlieGolf. 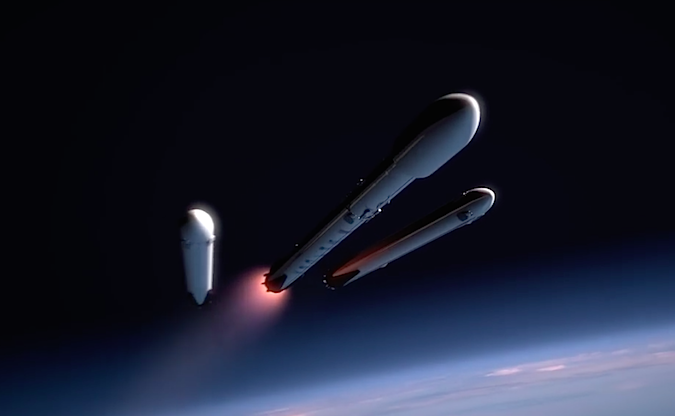 “Just to reiterate, the payload for the first Falcon Heavy rocket will be a Tesla electric car, playing Space Oditty, heading for Mars,” wrote @JC_Channel. “I love the thought of a car drifting apparently endlessly through space and perhaps being discovered by an alien race millions of years in the future,” Musk tweeted Saturday. The payload and destination for SpaceX’s first Falcon Heavy launch has been the subject of speculation. 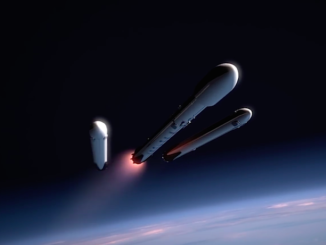 Musk told reporters in March that SpaceX would put “the silliest thing we can imagine” on the first Falcon Heavy flight. The company placed a wheel of cheese on the first flight of its Dragon cargo craft in an ode to the Monty Python comedy group. The Tesla Roadster weighs about 2,760 pounds (1,250 kilograms), measures nearly 13 feet (3.9 meters) long and spans about 5.7 feet (1.7 meters) wide, according to Car and Driver magazine. That’s well within the Falcon Heavy’s lift capability to go to Mars. 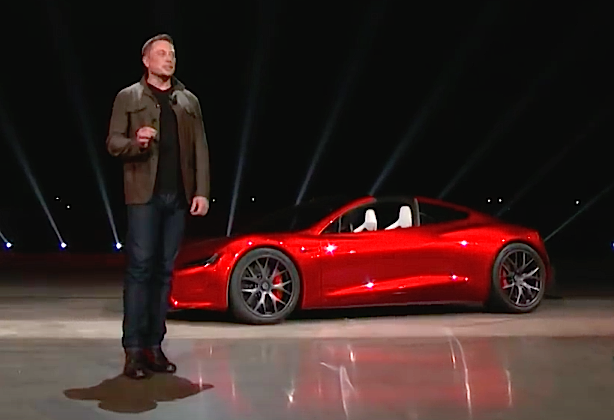 Musk’s tweet left open the question of whether the Roadster would enter orbit around the red planet, or fly to the distance of Mars’ orbit, perhaps for a flyby. In order to insert itself into orbit around Mars, the car would need a rocket pack to slow down for capture by Martian gravity. Ideal Mars launch opportunities only come once every 26 months, when space probes can make the journey in less than a year. The next Mars launch window opens in the spring. Launching at another time does not preclude a trip to Mars, although the payload would have to take a longer route, or use a lot more fuel to bend its trajectory and shorten the voyage. “What he means by this is what’s sometimes called a Hohmann transfer orbit, an orbit around the Sun that takes it as close to the Sun as Earth and as far out as Mars,” Plait wrote. Three rocket boosters based on the Falcon 9 rocket’s first stage will power the Falcon Heavy rocket toward space, delivering 5.1 million pounds of thrust from 27 Merlin 1D main engines. Technicians are preparing hardware for the maiden Falcon Heavy launch inside SpaceX’s hangar at launch pad 39A at NASA’s Kennedy Space Center in Florida, where Apollo moon missions and space shuttles lifted off. SpaceX needs the Falcon Heavy to loft the heaviest satellites for commercial and U.S. military customers. 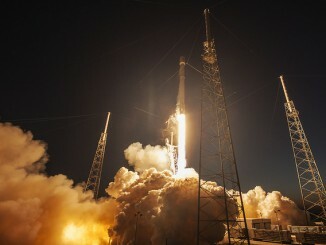 It could also hurl large clusters of lighter satellites into orbit to build out new broadband communications networks. 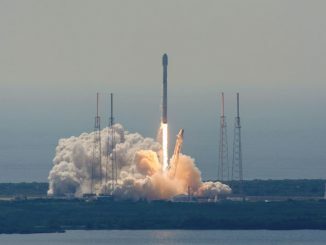 If the Roadster reaches Mars, it would be the first SpaceX payload to visit another planet. Musk announced in September his updated vision for settling Mars, and announced that SpaceX is working on a giant new rocket dubbed the BFR that could send cargo and crew ships to the red planet, or perhaps the moon if a lunar base becomes reality.